Abundant vitality under all conditions is the keynote of the Triumph "Bonnville 120." With exceptional topend performance goes extraordinary vigour and tractability at low and medium engine speeds - a combination which makes it perhaps the fastest point-to-point roasster produced in Britain today. In London traffic it was one of the most pleasant machines we have ever used, thanks to its complete docility, reliable tick over and smart get-away. On the open road it had what has been aptly termed "explosive acceleration" and an ability to swallow mile after mile at the very highest cruising speeds. Some of the startling acceleration results from a lowish overall gear ratio - too low, actually, to give the optimum in sheer speed. When, under still-air conditions, this "650" flashed through MIRA's electronic trap at 108.2 mph, the rev-counter showed that the motor had run on past its peak power. So the speed-merchant could get even more knots by cogging up a shade. But if road work were his aim he would be ill-advised, for the top gear in use greatly assisted maintenance of speed under adverse conditions, aided acceleration and was a good all-round ratio. 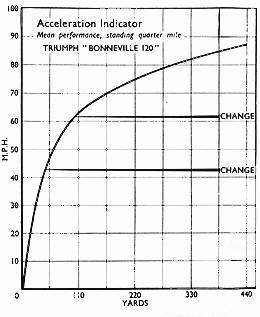 Proof of this is the fact that the "Bonneville" lapped the 3-mile banked circuit at exactly 108 mph and was not even 1/4 mph faster through the spot-check of the timed trap at either the start or the finish of a flying lap. This shows remarkable and praiseworthy consistency. 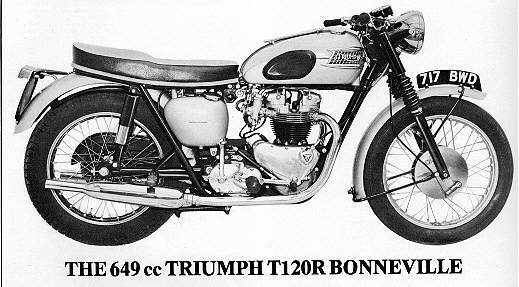 On a day when the wind was so strong that testing had to be abandoned, this Triumph actually reached a rider-prone 115mph down-wind after only 1300 yards of full acceleration from the rest! As the conditions were unrepresenttive, this figure is not quoted in the test data: nevertheless, it is interesting. On the same day, the tester also reached an indicated 100mph at the end of the standing quarter whilst normally seated with the wind behind him - again exceptional, but dazzingly fast. Any comment on the "120" is bound to concentrate on acceleration, for this is the machine's strongest attribute. It was not necessary to row it along on the gear pedal. Results (and what results!) were forthcoming all the way up the scale. The engine could be stirred up, top-gear home, at just under 30 mph with the easily read and ideally placed rev-counter showing a mere 1,800. No coaxing was necessary. A good handful of grip, increased as the revs went up, would take the machine cleanly and unhesitatingly to the top side of 100 mph true, without the rider even crouching. There was no sharply defined power band - merely a small bonus in urge from 4,500 rpm upwards. Vibration was not absent, but was never excessive. There were no "periods" and the back groung tremors were always within the rider's tolerance. Curiously, although the left footrest became quite "tingly" above a speedometer 90 in top and pro rata in the gears, that on the right was hardly affected. The current "120" has twin Amal "Monobloc" carburoters. each with its own float chamber, and automatic ignition control. In this trim it was almost incredibly docile for a machine of its type. Asked for sheer performance, the "120" gives a quick answer. Stir it up in the gears without a secure grip on the bars, and one has to shut down hastily and get back onto the front of the dual seat. The motor, we were told, was "safe" up to 7,500 rpm, but one took it up to these revs only when hustling towards a downhill maximum in top. In the gears, change-up revs were entirely the choice of the rider: we usually shifted at just over 6,000rpm when merely hurrying and nearer 7,000 when plotting the acceleration graph. Type Parrall twin four stroke. Generator Lucas RM15 6v alternator with full wave rectifier. Second Gear 61 mph Third Gear 88 mph Top Gear 106mph. Primary Drive Single row chain Secondary Drive Single row chain Clutch Multi plate in oil bath. Shock Absorber Rubber pad type in clutch. Frame: Brazed cradle with twin front down tubes. Front Suspension Telescopic with coil springs and two way hydraulic damping. Rear Suspension Swinging fork with two Girling adjustable three position hydraulically damped spring units. Brakes 8in dia.front, 7in dia. rear. Total lining area 32 1/2 sq. in. Fuel Tank Welded steel, twin lever type taps. Lamps 30/24w. head, 3w pilot, 18/6w stop/tail, 1.8w speedo & tacho. The "Bonneville" would always surge away again on engaging the higher cog. Silencing placed a limitation on grip-winding in some circumstances: the reapplication of power at, say 35mph in third brought a pretty sharp burst of sound from the twin exhausts. The pipes are small-bore ones. This is a machine completely without temperament. Starting was of the "prod-it-and-go" order and was not the slightest bit harder when cold. Chokes are not fitted, so a good flood was necessary. 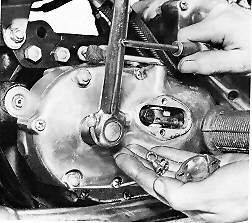 Shown here is the two screw cover for the clutch pushrod adjustment. The clutch plates parted at the first jab and bottom gear went in quietly from cold. But its engagement became noisy when the unit was hot. Tick over was always 100% reliable, slow and consistently "on two", a condition not always forthcoming from twin carby layouts. The adjusters to the throttle cables were conveniently accessible but not needed. Oil consumption could not be accurately checked because of leakage past the tank cap at speed, but the engine itself appeared to be using none. The clutch was light in action, beautifully sweet and obeyed orders exactly. To this component must go a due proportion of the praise for searing sprint starts. No particular technique was needed to operate the gearbox. Neutral was readily found from either bottom or second when approaching, or actually at a standstill. The pedal works one down and three up. It was well placed and called for only light toe pressure even at high rpm in the intermediates. All changes where made with the clutch. If third to top was done clutchless (and on this machine it was tried only experimentally), a pause was necessary before poking tome home; the interval increased with road speed. Both brakes-- of the new style dubbed "floaters" at Meriden---were good. 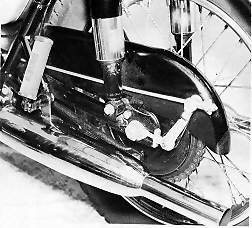 But the front unit, although proof against fade, called for high lever pressure and did not provide all the stoping power that a really competent rider would have been able to use. Both were waterproof---and safe to use on a wet road. Normally, navigation was good. But high speed handling was of the kind which some car people call "interesting." On really fast corners the machine was not completely steady; there was a certain amount of unauthorised rear wheel movement. The suspension appeared to need more damping on both strokes at both ends. Around the 100 mark on straight but bumpy roads called for concentration by the rider. On the billiard-table smooth bowl of MIRA, however, the "120" was completely sure-footed at ceiling speed. The springing was tremendously comfortable for a sportster. Very considerable angles of banks were possible and nothing was grounded. A pillion passenger was not the slightest handicap; the rear units are adjustable to compensate for varying passenger weights. Lights on the test mount were below par for this widely used Lucas equipment. We suspect that 717 BWD had a poor block-lens light-unit. The horn, located under the saddle, was nearly audible to the rider, but it did seem to have some affect on pedestrians. The riding position was delightful. Considerable adjustment was possible at the bars and rests. The seat was roomy and comfortable, and the riders feet could reach the ground. Th tank was of the right width and the knee grips well placed. Centre and prop stands were easy to use and gave good support. Every control, instrument and switch was excellently placed and contributed in its small way to making this machine such a pleasure to test. 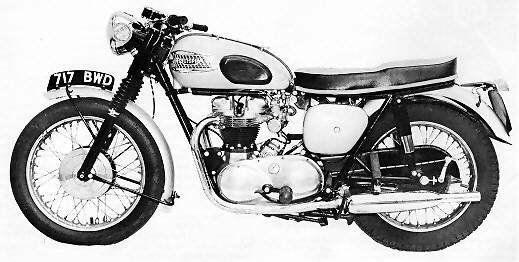 Truly difficult to fault, the Bonnville is an object lesson in how a motorcycle should be engineered. It not only passed the test routine with flying colours. but enabled saffmen to get some extremely high point- to- point averages on urgent Press assignments without fatigue or saddle soreness. We are happy to know that the machine will be coming back to us for a further test report when fitted with the optional high-speed equipment available from the factory.